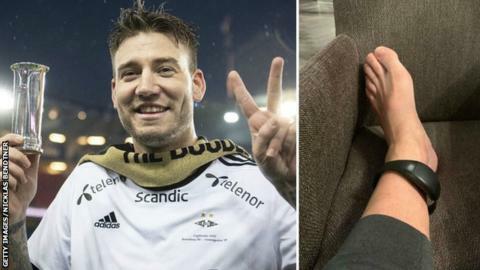 Ex-Arsenal striker Nicklas Bendtner has started his 50-day sentence for assaulting a taxi driver and posted a picture of his electronic ankle tag. The 30-year-old, who plays for Norwegian side Rosenborg, is serving his sentence at home in Denmark. He admitted hitting the taxi driver but said it was because he felt threatened. "Of course I wish it hadn't happened," said the Danish international. "Both for me and for the taxi driver involved who subsequently lost his job." The incident took place in September. At trial, the City Court of Copenhagen was shown CCTV footage in which it appeared Bendtner struck the driver in the face. He said the driver threw a bottle or a can towards him and his girlfriend when they left without paying. In a lengthy post on Instagram, he added: "No matter how he [the driver] behaved and what he said, it's not something I wanted for him. There were undoubtedly many other and better ways that each of us could have resolved our disagreement. "If I had just paid the amount the taxi meter showed, my girlfriend and I might not have been pursued by a car with an enraged driver behind the wheel. "If only I hadn't made this decision, which I made in a split of a second while everything was boiling over." Bendtner dropped his appeal against the sentence in late November to "focus of his club and family", with the Norwegian season beginning in March. "I will probably never, agree with the City Court's judgment, but I have dropped my appeal because I would like to be ready for the season with Rosenborg," he added, saying the club is the "warmest and most loyal employer" he has had in his career. The former Juventus player, who is still training six hours per day at home, said he has started writing a book with "openness not specially typical in top footballers". He added: "Fortunately, it is never too late to learn and prepare for the future, and so I have decided to gather the stories that did both good and evil to me for almost 31 years. "This is not the story of me driven by speculation and sensation, but by my strong memory." Bendtner enjoyed a successful 2018 season, winning the Norwegian top-flight and scoring two goals in the final as Rosenborg won the Norwegian Cup on 2 December. He played for Arsenal between 2005 and 2014, scoring 45 goals in 171 games. There were loan spells at Sunderland, Birmingham City and Juventus while at Arsenal, before making a permanent move to German club Wolfsburg. He moved back to England to join Championship side Nottingham Forest in September 2016 before joining Rosenborg in March 2017.